"Irish Mowers - Great lawnmowers in Ireland at great prices"
Ride on lawnmowers and garden tractors are intended for use in larger garden. They are ideal for areas from 0.5 acres to around 5 acres in size. Ride on mowers in Ireland have proven to be a great investment for our customers. A new tractor mower will help you cut your lawn in record time, affording you more time to spend as you please. A ride on lawnmower from Irish Mowers will generally range from around 30" in size up to large 50" cutting widths, all from recognised and reliable brands such as Snapper and Honda. Our lawnmowers all come with tried and tested engines that are proven workhorses for Irish gardens. We supply mowers with Briggs and Stratton, Honda, Kawasaki, Kohler and GGP/Mountfield engines. Engine sizes can range from a 344cc single cylinder engine which could put out 11 - 13.5hp up to huge 656cc twin cylinder engines on our larger models. Many of our models come with tow bars and chassis' suitable for fitting ride on lawnmower attachments. These attachments can convert your lawn tractor from a lawn mower to an year round garden machine that will cut the grass in the warmer months, sweep up leaves in the autumn, transport logs for the winter and turf preparation in the spring. Ride on lawnmowers and garden tractors are available with a number of different cutting methods, each with their own benefits. A conventional ride on lawnmower is often referred to as a garden tractor and can have a cutting width of anything from 30" - 48". They have integrated grass collectors with either a direct chute up the middle of the machine or a chute out the side. Many of these conventional ride on lawnmowers can be fitted with a mulching plug if you need it. 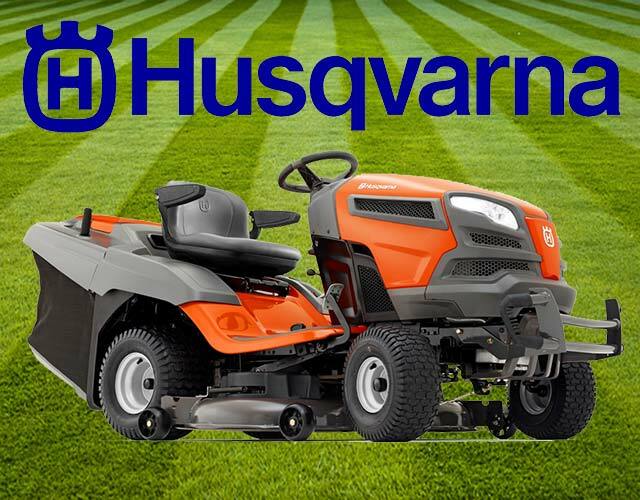 Snapper, Honda and Husqvarna are our main brands of conventional ride on lawnmowers in Ireland. If you wish to buy a conventional ride on lawnmower but have no need to collect the clippings you can buy a mulching ride on mower. These models are often slightly cheaper than their bagging equivalents and eliminate the need to collect and dispose of your grass clippings, which can come in handy for people with large areas to cut. All our ride on mowers for sale come fully assembled and built ready to cut your lawn. Our delivery man can show you the features of the lawnmower and give a demonstration when he arrives. A user manual is provided with all our new ride on mowers, we advise you to thoroughly read it and understand the content before using your new lawnmower. Always operate a ride on lawnmower in accordance to the manufacturer's guidelines.